With previous offerings virtually sold out, the last available residential estate investment opportunity in the Umhlanga Ridge area is opening up for an astute developer. Phase 2B an attractive opportunity on the idyllic Izinga residential location is being made available by the property development operation of Tongaat Hulett. This creates a significant opportunity for a residential development which will allow a potential 600 homeowners to boast the Izinga address. 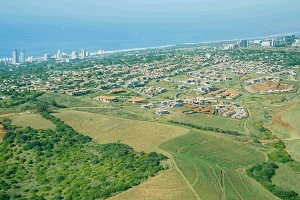 An aerial photograph showing Izinga 2B, Tongaat Hulett’s unique development opportunity opening up in Umhlanga Ridge. Offering flexibility and opportunity for either an individual or consortium-based approach to investment, Izinga is the gateway to high-end living in a wonderfully tranquil, secure environment. If the previous phases of Izinga are anything to go by, this opportunity will prove an extremely popular and sought after area for luxury dwellings. Already nearing completion, earlier land releases boast exquisite open spaces, carefully tended and maintained landscapes, popular cycle paths – a luxury estate with everything you need for the quintessential family lifestyle. With the added benefit of its 24-hour security and proximity to amenities, it is anticipated that the level of demand for the next Izinga release will be high. Top schools, excellent shopping centres and the beach are all within easy reach of the project. The King Shaka Airport is a mere 10 minutes away on the N2. The development options go beyond just houses making provision for a range of uses including multi-unit development, dwelling houses, a retirement centre, apartments and potentially a hotel. Situated just 20 km north of Durban, Izinga is a constituent part of the rapidly-growing Umhlanga Ridge – an area which has attracted in excess of R50 billion in investment. The development is expected to tap into the flourishing demand for high end residential property in the burgeoning Northern Urban Development Corridor. The impact and acceleration of development here makes this corridor a prime location for real estate investment at, predominantly, the higher end of the value realisation spectrum. With its sense of space, wonderful views, peacefulness and security, Izinga Phase 2B presents prospective investors with an eye for highly attractive property propositions, the ideal coastal development opportunity, in a region in which such potential is becoming increasingly limited. Tongaat Hulett is an agriculture and agri-processing business, focusing on the complementary feedstocks of sugarcane and maize. Its ongoing activities in agriculture have resulted in the company having a substantial land portfolio within the primary growth corridors of KwaZulu-Natal with strong policy support for conversion from agricultural to more intensive urban and tourism uses at the appropriate time. A core strategy is to maximise the value creation for all stakeholders from optimum utilisation of this land portfolio. Through its sugar and starch operations, Tongaat Hulett produces a range of refined carbohydrate products from sugarcane and maize, with a number of products being interchangeable. Global sweetener markets continue to be dynamic and the business seeks to optimise its various market positions, leveraging off its current base to maximise revenue from these products. The business’s sugar operations are well placed to benefit from evolving dynamics of renewable electricity and ethanol in South Africa, and the Southern African Development Community (SADC) region.